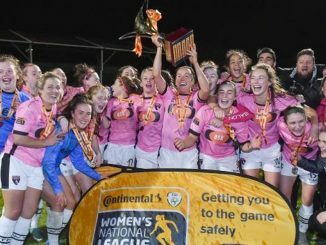 Peamount United striker Amber Barrett was the star of the FAI Continental Tyres Women’s National League awards, as she scooped the Player of the Year and Golden Boot awards, reports wnl.fai.ie. Following Cork City’s Continental Tyres FAI Women’s Cup final win last Sunday, Saoirse Noonan was crowned the Young Player of the Year, while the Team of the Year was also announced at the ceremony at the Guinness Storehouse, Dublin. Barrett pipped UCD Waves midfielder Karen Duggan and Cork striker Clare Shine to the Senior Player of the Year award after a fantastic season which has helped her breakthrough into Colin Bell’s Republic of Ireland squad. With an outstanding 16 goals during the campaign, the Peamount ace was also crowned the Irish Daily Mail Golden Boot winner. Noonan pipped Peamount duo Heather Payne and Niamh Farrelly to the Young Player of the Year award. Barrett told wnl.fai.ie: “I’m absolutely thrilled to stand here with the Player of the Year award and the Golden Boot award. “I’ve got to thank all of my team-mates and the staff at Peamount United who’ve really helped me find another level this season and has helped me break into the international team as well. I decided to give up my other sport during the season and that has really helped me concentrate on improving my game. “It was tough to finish second in the league behind Wexford Youths but it shows the quality we’ve got in the young squad we have and I’m positive we’ll bounce back next season and provide another title challenge.